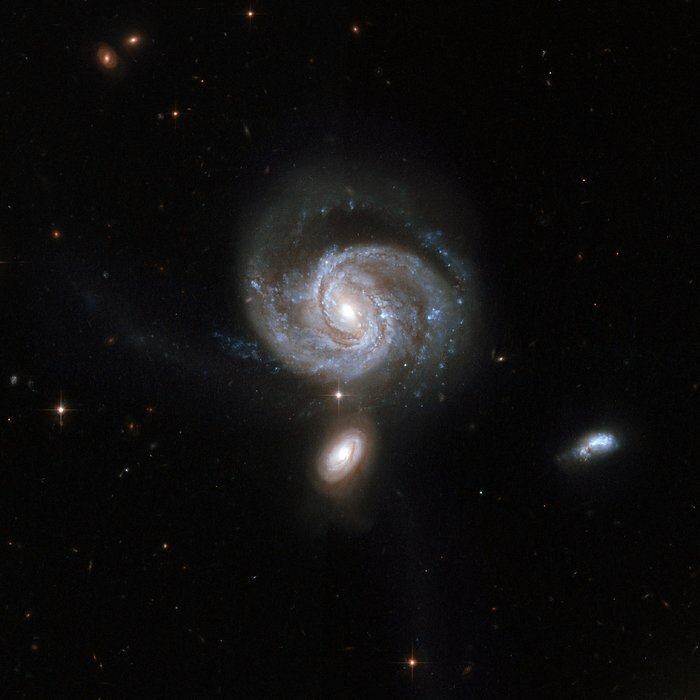 NGC 7674 (seen just above the centre), also known as Markarian 533, is the brightest and largest member of the so-called Hickson 96 compact group of galaxies, consisting of four galaxies. This stunning Hubble image shows a spiral galaxy nearly face-on. The central bar-shaped structure is made up of stars. The shape of NGC 7674, including the long narrow streamers seen to the left of and below the galaxy can be accounted for by tidal interactions with its companions. NGC 7674 has a powerful active nucleus of the kind known as a type 2 Seyfert that is perhaps fed by gas drawn into the centre through the interactions with the companions. NGC 7674 falls into the family of luminous infrared galaxies and is featured in Arp's Atlas of Peculiar Galaxies as number 182. It is located in the constellation of Pegasus, the Winged Horse, about 400 million light-years away from Earth. Position (Dec): 8° 46' 47.65"